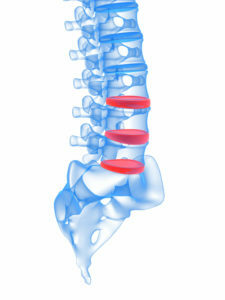 Metal implants can be used to hold the vertebrae together until new bone grows between them.Metal plates can be screwed into the bone, joining adjacent vertebrae.An entire vertebra can be removed, and the spine then fused.A spinal disc can be removed and the adjacent vertebrae fused.This procedure can be done through an incision on the front (anterior) or back (posterior) of the neck. Anterior cervical discectomy and fusion (ACDF) is a surgery to remove a herniated or degenerative disc in the neck. An incision is made in the throat area to reach the front of the spine. The disc is removed and a graft is inserted to fuse together the bones above and below the disc. Posterior Cervical Fusion (PCF) is the general term used to describe the technique of surgically mending two (or more) cervical spine bones together along the sides of the bone using a posterior (back of the neck) incision. Bone graft is placed along the sides the spine bones, which over time, fuses (mends) together.